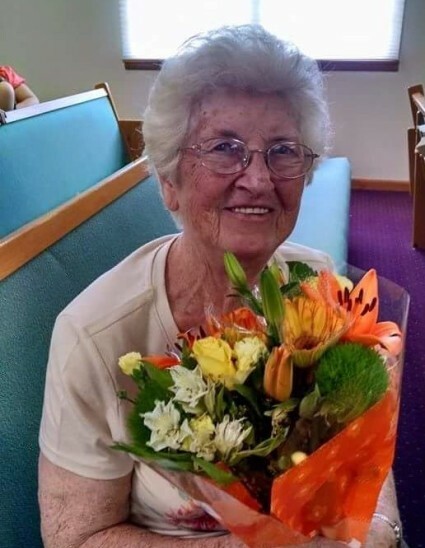 Mildred Leona Bland, 81, went to be with the Lord on Friday, April 5, 2019 in Franklin. She was born June 3, 1937 in Breckenridge, Kentucky to the late Wilbur and Thelma (Leslie) Sharp. She married Robert L. Bland on January 21, 1956 in White Mills, Kentucky. He preceded her in death on February 8, 2014. She was a homemaker and faithful member of Open Door Fellowship, formerly Temple Baptist Church. Her hobbies included cake decorating, singing and visiting nursing homes and the shut ins. She enjoyed going to church and attending church functions, garage sales and spending time with her sisters. She liked going for rides with her children, going to the beach with her grandson Greg and his family and sitting on the front porch listening to the birds. She loved her family and spending time with her grandchildren, great-grandchildren, nieces and nephews. Survivors include her daughters, Cindy Rodriguez of Franklin, IN, Vickie (Woody) Ferguson of Spencer, IN, nine grandchildren, Victoria Brame, Stephanie Neese, Jessica Vail, Josh Herald, Atlantis Branham, Greg Lanham, Tasha Giddens, Jeremy Giddens, Brian Huffman, 23 great-grandchildren and several nieces and nephews. She was preceded in death by her parents; her husband Robert L. Bland; her daughter; Jacqueline Burge; her brothers, Herbert, Wavy and Harley Sharp; five sisters, Ora Pile, Dora Sanders, Lillian Sharp, Vitula Hughes, Katherine Bland and two great-great grandchildren. Funeral services will be conducted at 1:00 p.m. Wednesday, April 10, 2019 at Jessen Funeral Home, Whiteland Chapel, 729 N. U.S. Hwy 31, Whiteland, IN 46184. Visitation will be from 11:00 a.m. until the time of the service at the funeral home. Burial will be at Greenlawn Cemetery in Franklin.